It is difficult to overstate the impact that the invention of the printing press had on the development of European culture. Johannes Gutenberg was born in Mainz in 1398, a child of the Medieval world, yet by the time of his death, in the same city, in 1468, that world had been transformed by the new technology that he had developed. In a very real sense, the printed word defines the transition from the Medieval to the Early Modern age. 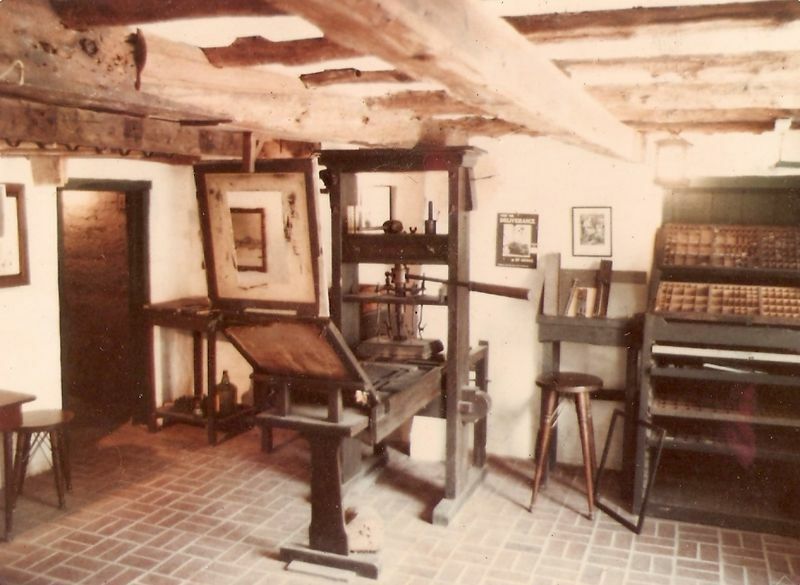 A replica of Gutenberg's printing press, Mitchell House, St George's, Bermuda. Photo: Aodhdubh (licensed under GNU). The printed book revolutionised the relationship between individuals and the world around them. It literally broadened people's horizons. Before TripAdvisor there were Baedecker's Guides (beginning in the 1850s), but the earliest travel guides were produced in the 15th Century, in the very early days of the printed book. Medieval people travelled a good deal more than is sometimes supposed, and some of them wrote accounts of their journeys. There is even a Medieval "Pilgrim's Guide" to the road to Santiago de Compostela, but this was a bulky and expensive package, hand-copied on vellum, to be consulted in a monastic library, not carried in a rucksack. Printing on paper made it possible for many more people to own books. It also created commercial opportunities for people who wrote and published them. Among these were the first travel writers. At Venice, in the year 1480, three men boarded the same galley, bound for Jerusalem. They were the Milanese Cavalier Santo Brasca; the Swiss/German theologian, Felix Fabri; and the anonymous French author of the Voyage de la Saincte Cyte de Hierusalem. We don't know whether these men spoke to one another (if they had a common language it would have been Latin), but each would go on to write a book. Manuscript of Felix Fabri's Evagatorium, Stadtsbiliothek Ulm (image is in the Public Domain).
" ... he should carry with him two bags - one right full of patience, the other containing two hundred Venetian ducats, or at least one hundred and fifty - namely, one hundred, which each person needs for the voyage ... the other fifty for illness or any other circumstances that may arise ... let him take with him a warm, long upper garment to wear on the return journey, when it is cold; a good many shirts, so as to avoid lice and other unclean things as much as possible ... He should make an agreement with the captain, who usually requires from fifty to sixty ducats. For this price he is obliged to provide the passage there and back, supply all food (except on land); pay for the riding animals in the Holy Land, and also pay all duties and tribute. Next he should cause to be made an overcoat reaching down to the ground, to wear when sleeping in the open air, and buy a thin mattress instead of a bed ... let him take a supply of good Lombard cheese, and sausages, and other salt meat of every sort ... Above all he should have with him a great deal of fruit syrup, because that is what keeps a man alive in the great heat." Printing allowed illustrations, as well as words, to be reproduced, and the more expensive editions included maps and drawings, giving an indication of the route to be followed, and the animals and people that might be encountered along the way. Illustration of Mount Sinai, from en edition of Fabri's Evagatorium, Stadtsbibliothek Ulm (image is in the Public Domain). Illustration of the Church of the Holy Sepulchre, Jerusalem, from Bernhard Von Breydenbach's account of the pilgrimage in 1486 (image is in the Public Domain). These early travel guides were clearly taken by travellers with them on their journeys, and sometimes annotated by them, adding detail or updating the prices, as the volumes were passed between friends, or from one generation to the next. It is likely that the existence of these texts emboldened many people who might not otherwise have done so, the clear advice on prices, and on safety (Santo Brasca warns against taking cheaper passages on ships other than the official galleys, because of the risks from shipwreck and pirates), providing reassurance. 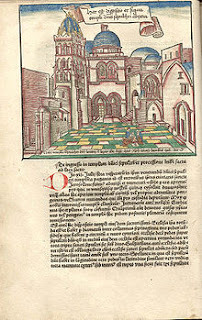 Annotated copy of Fabri's Evagatorium, Stadtsbiblithek Ulm (image is in the Public Domain). Gutenberg's innovation, however, did not just bring about a revolution in travel-writing, it also contributed to the spread of revolutionary ideas in politics and religion. Pilgrimage was viewed with disfavour by most of the emerging Protestant sects, and the focus of travel-writing shifted from religious to secular forms of travel. The age of the tourist had arrived. Yes indeed, and there are travel-guides from each subsequent period, invaluable resources when researching a novel!